The client is a Greece-based design agency that operates from Athens and New York. They provide sustainable designing solutions including, interior design, policy design, graphic design, etc., to various organizations across the US and Europe. They also offer renovation and retrofitting of the longstanding old structures. The client's requirement was precise, and they contacted Outsource2india to create architectural & 3D Revit models for a six-storey residential building standing in the hinterland of the Athens. As the client insisted on consistency throughout the creation of 3D Revit models of the six-storey building, we had to be extra careful with our validation process. The project complexity increased when we were sent around 40 GB data. Also, the client expected our team to go through the large volume of structural data in a very short period of time, two weeks to be exact. Further fanning the flames was the language barrier. Our client was Greek, and we struggled a bit in gathering their exact requirements. As the client had already provided complete data of the building they wanted to create the Revit model of, we appointed two engineers and one quality control expert to work on the project. 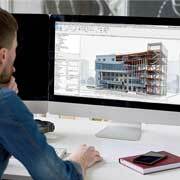 With our on-time, accurate, and consistent 3D Revit models, the client saved more than 20% of their overall cost. They were also able to reduce the workload and project time by 50%. Outsource2india supports the construction, design, and architecture industry through a variety of, Revit Modeling, BIM, and architectural drafting and detailing services. Our team has extensive experience in working with Revit 2019 and Autodesk Revit tool. They have served the 3D modeling, retrofitting, structure designing, etc. requirements of various global firms. If you want to create architectural and structural 3D Revit models for your buildings/structures, then, get in touch with us. Our team will contact you for a quote and requirement gatherings.